1. Guerilla gardening. Remember this? Yes. It got thrown out two weeks later. Anyway: I’ll try some guerilla gardening again this year! I got a primrose gifted last week and I’m looking forward to planting it outside when it’s done blooming and the weather right. 2. Underplanting tomatoes: Epic fail. I underplanted my tomatoes with basil, marigold and begonia and none of them continued to grow. They just stopped. ’till I threw them out, like, 5 months later. I’m not gonna try it again. 3. Leaving dead leaves on the soil. What might work in a garden in the ground in this case doesn’t work for container gardening at all: There are no worms or bugs to decompost dead leaves, so they just stay on top of the soil, keep moisture and hence are perfect for any kind of soil born diseases: mold, fungi, you name it. 4. 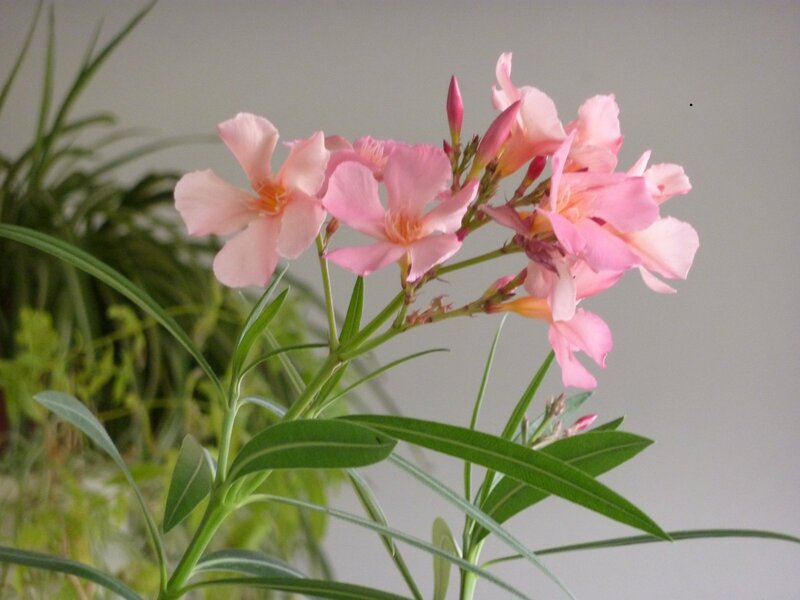 Keeping the oleander pest-free. Didn’t work this winter – again. Spider mites infested my baby once more and it looks pathetic now. 5. Overwintering herbs outside. Well, now I can tell that most – if not all – of them are dead. I tried to leave them outside because I know that they’ll only get ugly and leggy inside. Although I put them to the window sill (outside) where it’s the warmest, when the temperatures hit -10°C, they must have froven through. Well, it was worth a try. I’m reviving thig blog – so stay tuned for more! 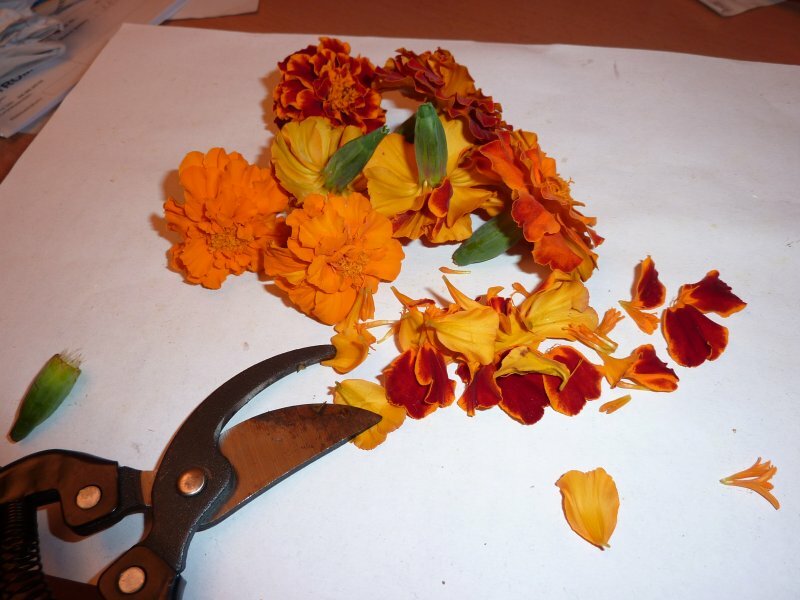 I have to admit: I didn’t like marigold (Tagetes) until i started growing them myself. I always thought they were boring and dull. I was so wrong! The truth is there is a broad range of marigold varietys available. They come from Mexico and are used there to decorate tombs for the famous “Day of the Dead”. 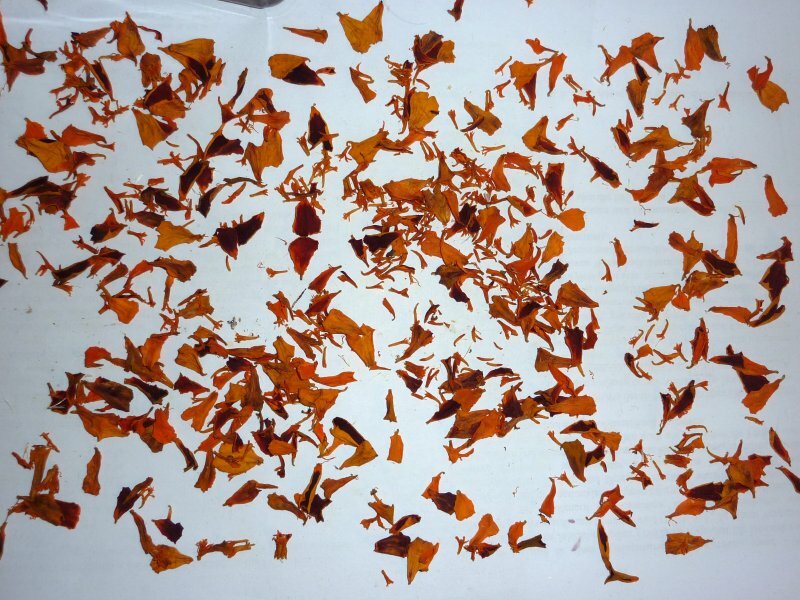 A special variety, Tagetes lucida, is even considered to have psychotropic effects. 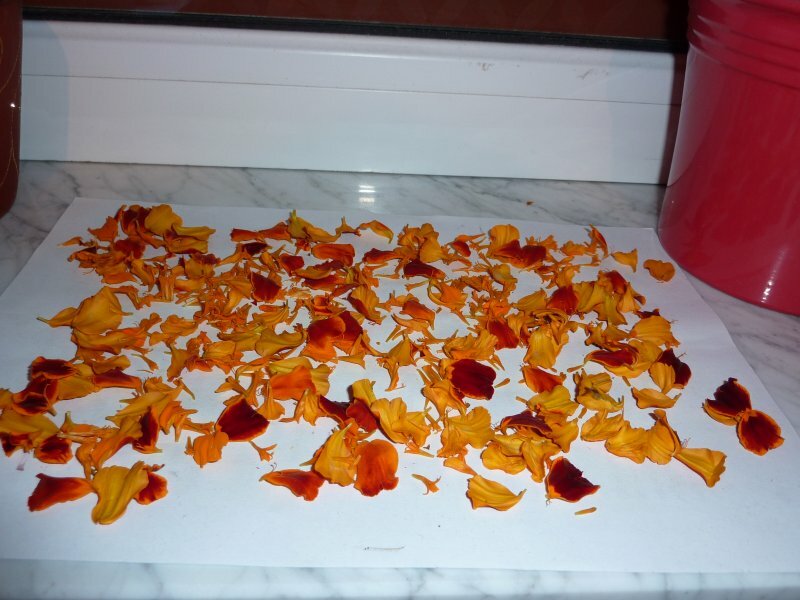 But I wouldn’t count on it… another variety, Tagetes tenuifolia, is cultivated not only for it’s beautiful looks but also for use in teas and perfume (mainly in Asia). 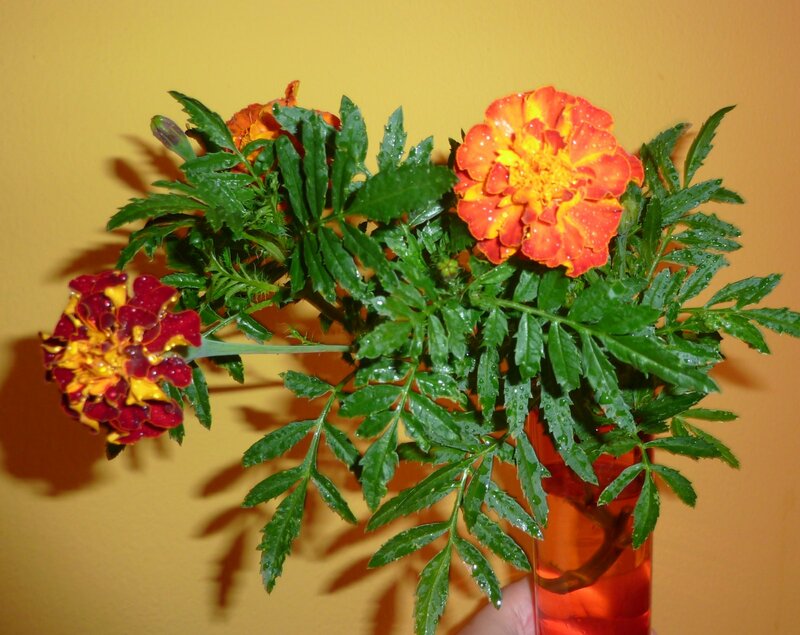 Tagetes minuta is the most potent variety for seasoning, but has only tiny flowers and grows tall and spindly. 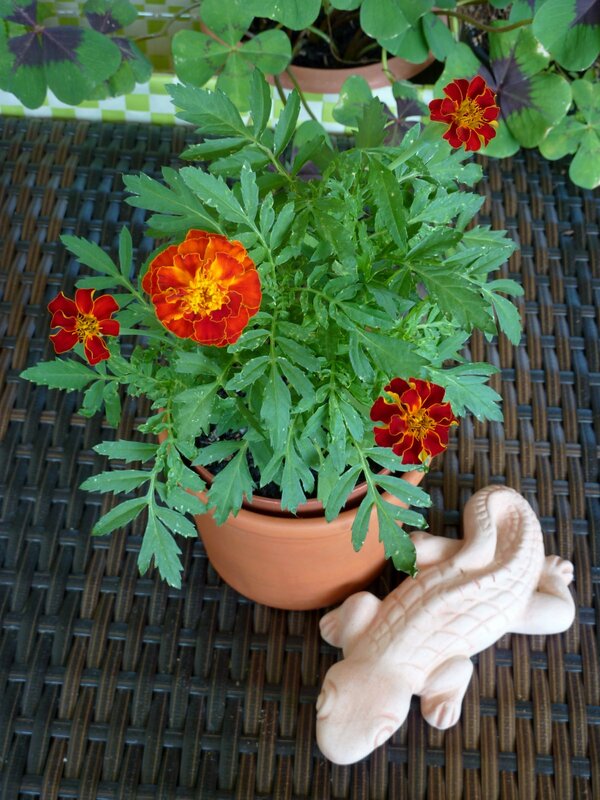 Marigold and lizard. Marigold died later, guess the pot was just too small. Lizard is doing well. 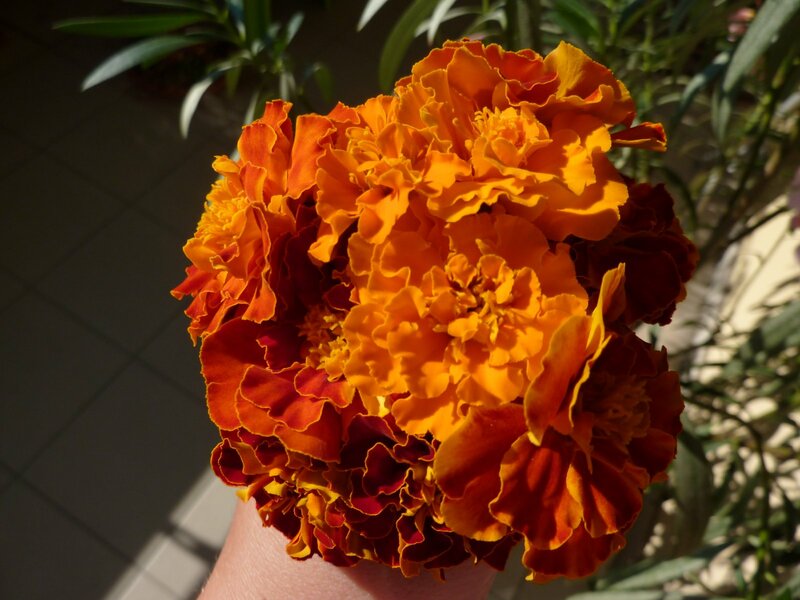 When we go to garden centers, what we see are usually cultivars of Tagetes erecta (African marigold) with huge flower “balls” or T. patula (French marigold) with smaller, often bicolored flowers. 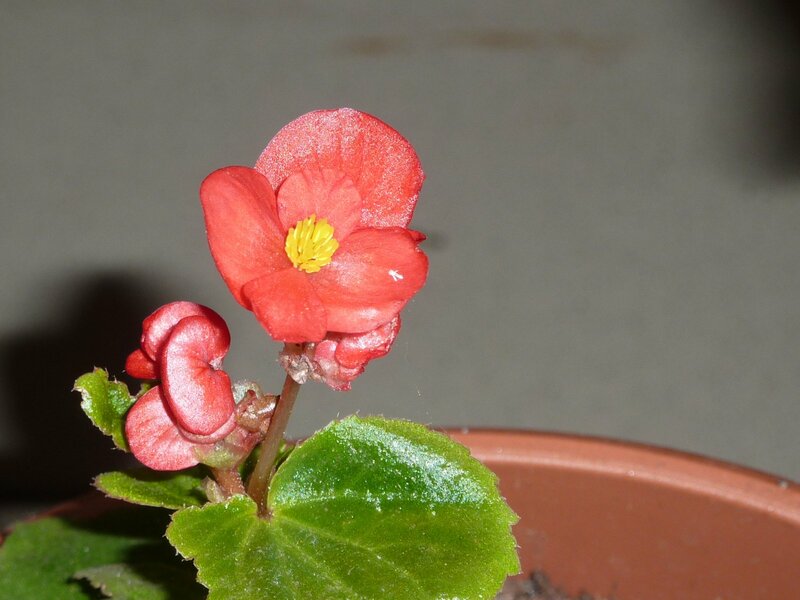 They grow about 10-100 cm tall and from very pale yellow to deep red-brown almost any blossom color is possible. 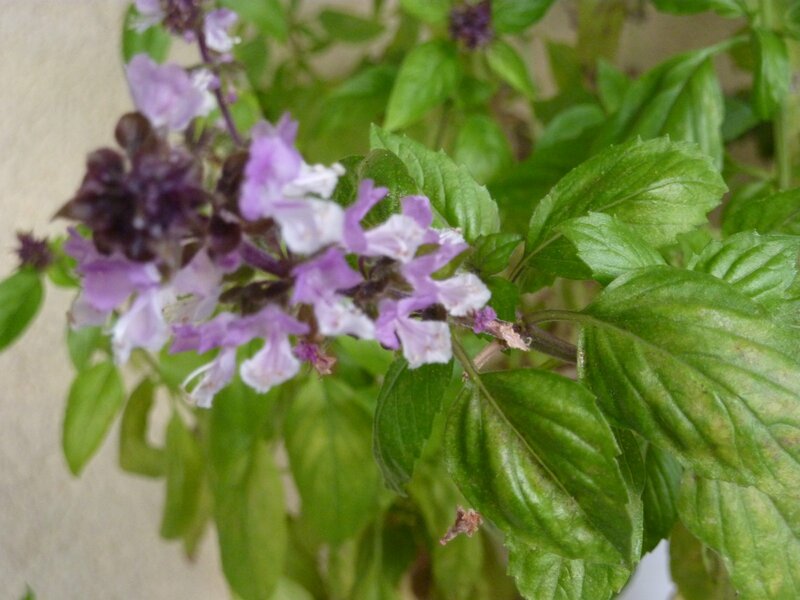 Besides for gardening , they are cultivated in China, India, Thailand and South America, mostly for the perfume industry or festive and religious purposes, but also for the pharmaceutical industry. Marigolds contain lutein which might help prevent macula degeneration (a certain loss of sight affecting elderly people). 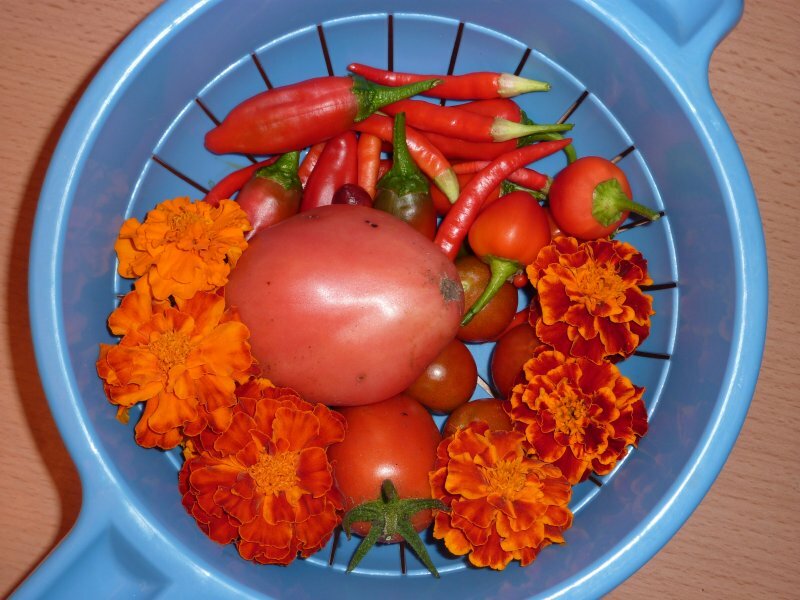 Marigolds are often used for companion planting: They repell white flies, nematodes (creepy worms living in the soil) and aphids. They also seem to have a fungicide effect, at least that was proven in labs. 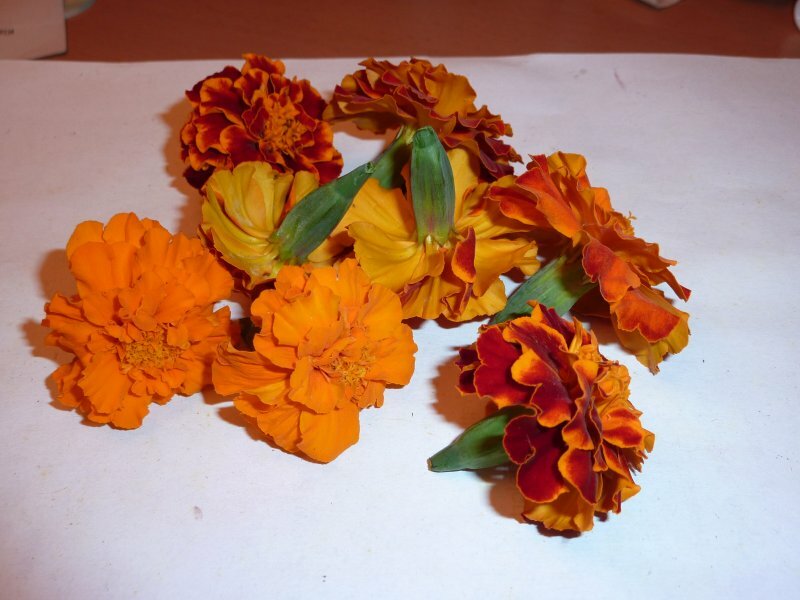 Marigolds companion well with plants from the nightshade family that can be particularily prone to pests. When grown in the ground, marigolds can be a slug’s favourite food – so be careful! 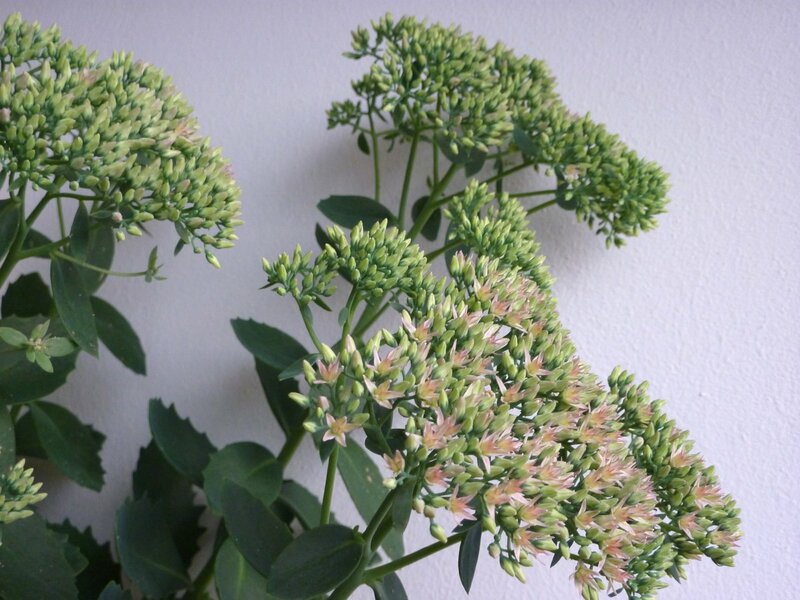 Start them indoors (or outside in a pot, far off the ground) and plant them outside when they are strong and big enough. I’d recommend you to plant them on a cloudy day when no rain is forecast and the soil is dry, that will keep the slugs away for some time. 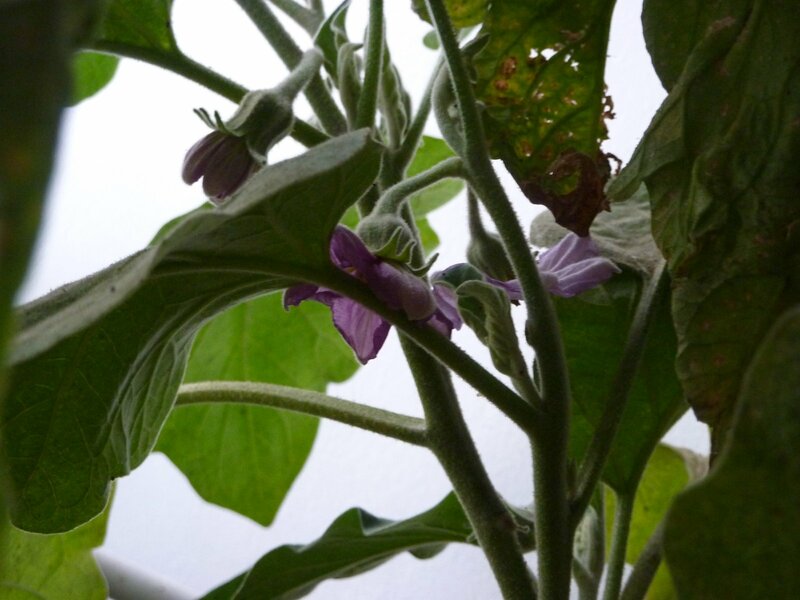 When the plants are well established, the can’t be eaten up easily. 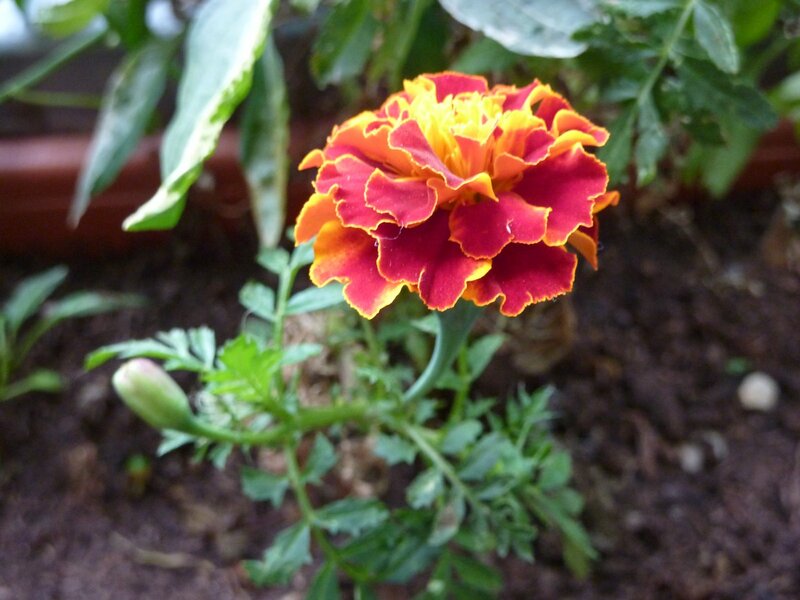 Marigolds like full sun and a well draining soil, but will grow in other conditions as well. Just try it! They don’t need to be fertilized. Blooming starts in May or June and continues until the last frost. 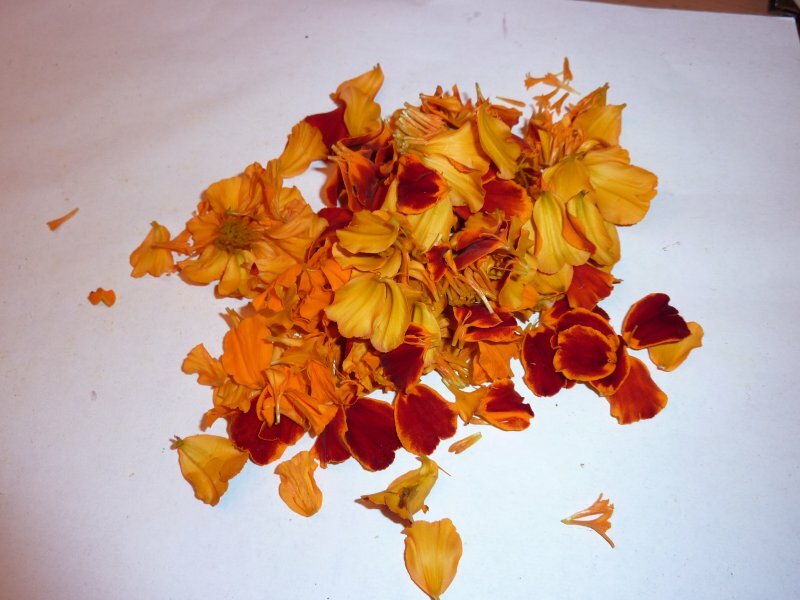 Marigolds are annuals, but you can easily pick seeds: Just let the flowers and seed pods dry completely, then pick and store airtight and cool (a jar in the basement will work just fine). My dad and I have been doing this for years now. I think the last time we bought marigold seeds was in the 1990’s. The colors of the flowers may vary every year. In containers, marigolds also grow very well. 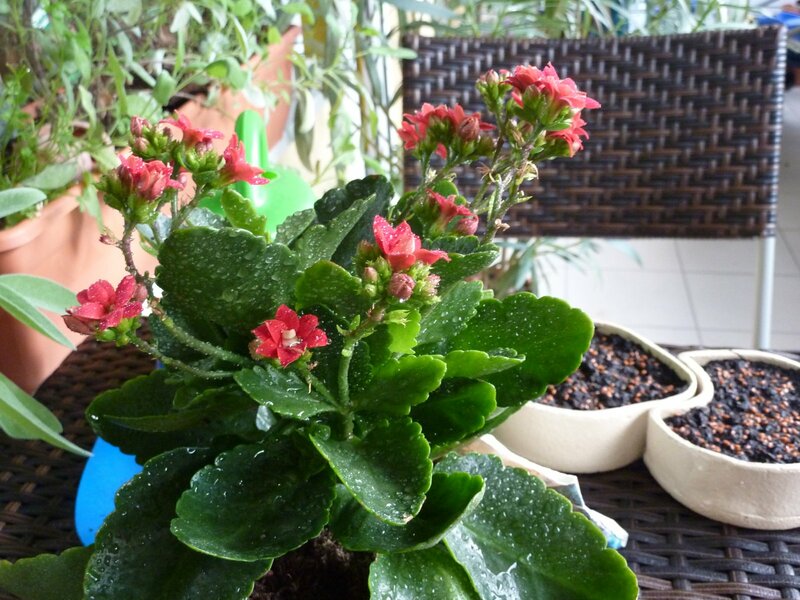 They don’t need a lot of space to become huge, so be careful that they don’t outgrow other plants. They will do well on sunny and part-shade balconys. They can also take some wind. Just be careful not to let them dry out too often, they can take some drought but not regular. Although they may bounce back. 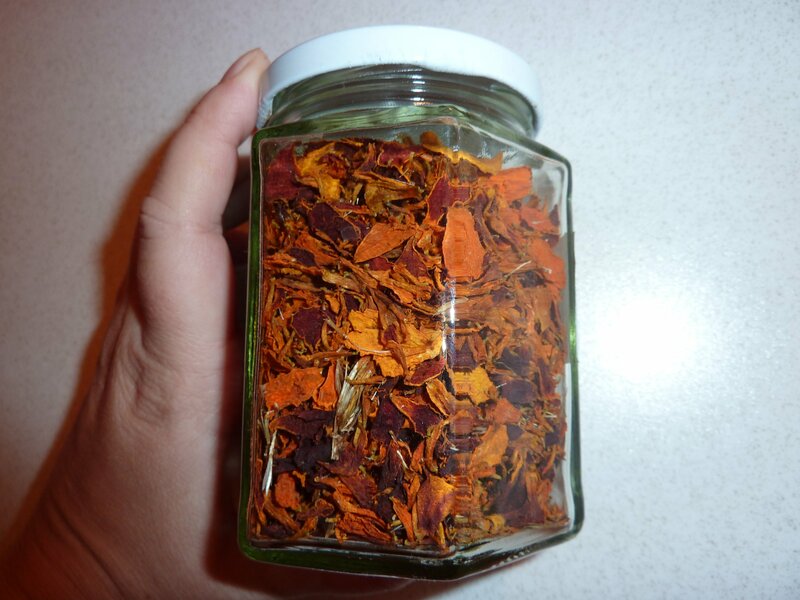 Well, not the best picture ever taken of my hand, but anyway: put the dried petals in a jar. You're done! You can also use the leaves, they are supposed to go well with meat. I’ve never tried it myself, but in case you did, let me know how it tastes! 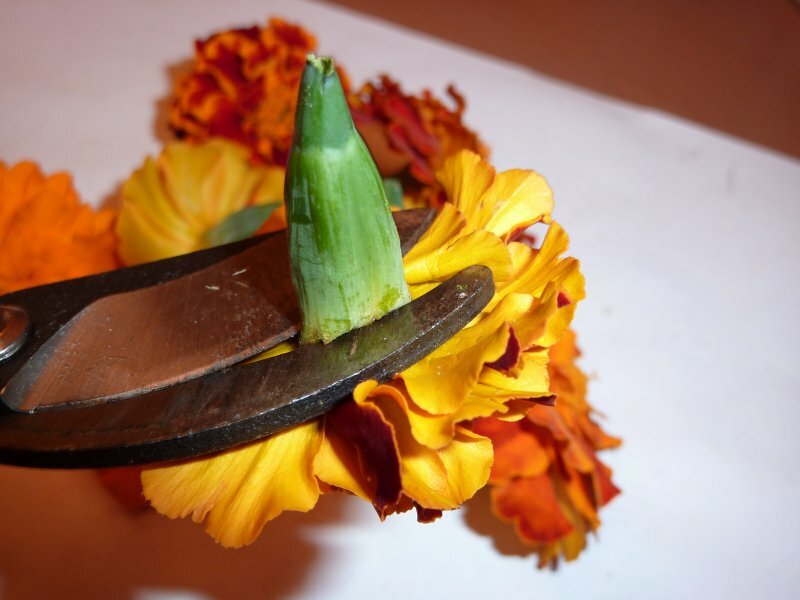 If you want to know how to save marigold seeds, MrBrownThumb has got a great post about it! The tomatoes are coming in at a steady pace again after a small hiatus during the last two weeks. 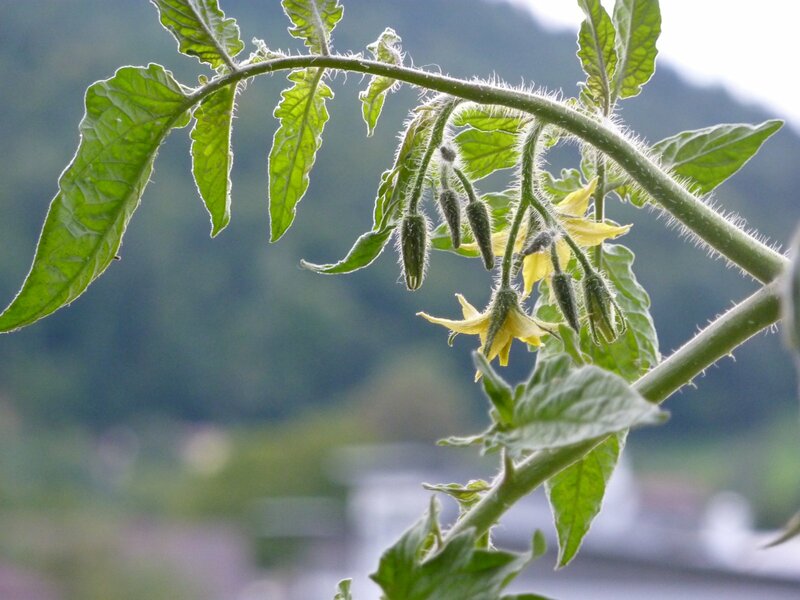 I’m very happy with the production of the cherry tomato plant – and with the taste! The beautiful, pinkish Italian heirlooms “Coure di bue from Lampedusa” (as I call them) are producing the biggest tomatoes. They taste great! The oval tomatoes are coming in just one by one, the fruits are rather small. Not so happy with them, neither with the striped tomatoes, they’ve failed to produce since July. I might throw them out very soon. The red round ones are on a hiatus, but there are still some fruits on the plant, so I’m hopeful. I’m also awaiting the first “Tumbling Tom” tomato this week. I’m really, really content with the hot peppers. They come in reliably at a steady pace. Only two kinds haven’t ripened by now: red cheese and red mushroom. Especially “Riot” is producing great. They are the classic, thin, long hot peppers. I dry them in a kind of Ristra. Many “Fish pepper” plants are on their way out due to spider mites (? ), but I don’t really mind, they’ve produced well and taste nice when green too. Overall I’m surprised by how well the hot peppers are doing! 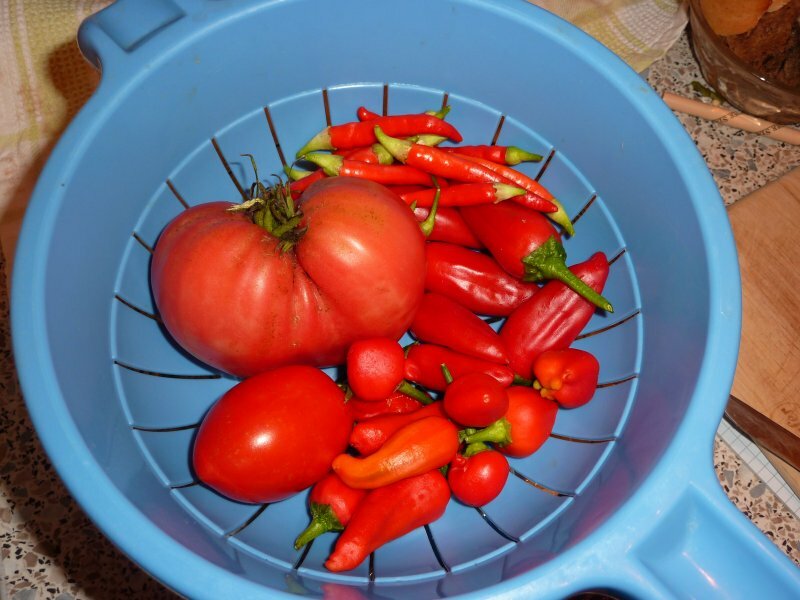 I harvest two or three colanders like the above every week. Besides the peppers and toms I harvest a lot of marigolds (for tea) and some herbs like basil, sage, rosemary, thyme, cinnamon basil, scented pelargonium, mint. I don’t weigh them – maybe next year! I’m still waiting for my first egg plant. 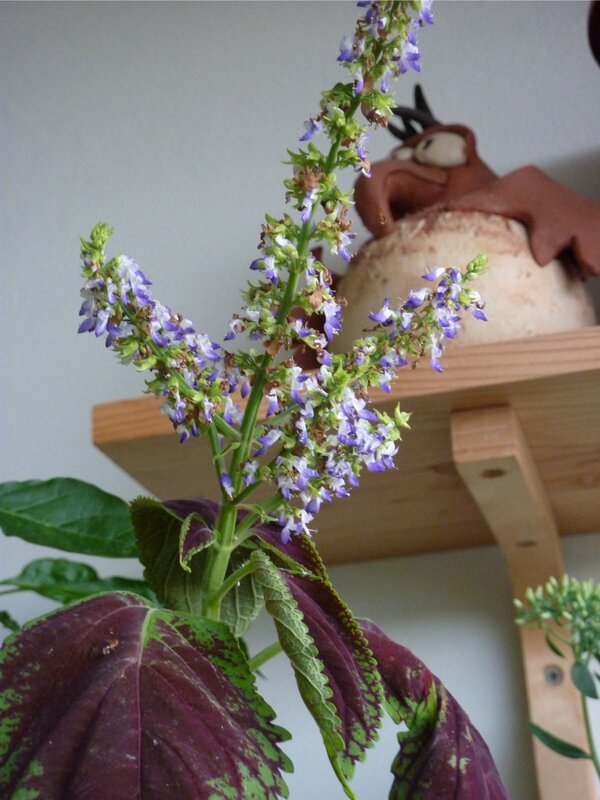 Two flowers broke off, the third seems to be pollinated successfully – I just want one fruit, that would really be enough, I just want to prove it’s possible. Keep your fingers crossed! More than 2,5 kg / 5.7 lbs by now (if I calculated it right). I’m participating for the first time in Harvest Monday, hosted by Daphne from Daphne’s Dandelions! Thank you for inventing this great day!